At the recent RHS Chelsea Flower Show miniature gardening made an appearance alongside the amazing show gardens, floral displays and trade stands. Working with the Horticultural Trades Association and Perennial, the Gardener’s charity, Fiddlehead produced a large fairy garden on the roof of a garden shed, as part of the HTA show garden 40 Sunbury Road. Using live moss and over 100 Alpines & Conifers, plus a wide selection from the Fiddlehead range, the fairy garden attracted a lot of interest from the media and public alike. The show garden won a silver medal for the best inspirational garden, demonstrating what can be achieved with limited space in a typical suburban space. 40 Sunbury Road was commissioned to celebrate Peter Seabrook’s 40 years in horticultural journalism and as well as the fairy garden it featured the Plant of the Year, a Morus Charlotte Russe. Fiddlehead products were available for sale at Chelsea for the first time, on the Perennial stand. Perennial are the only UK charity dedicated to helping people in horticulture and we are proud to be working with them this year at a number of shows, including Hampton Court, Malvern and of course Chelsea. One interesting piece of feedback to come out of the show was that more than half the customers who have purchased fairy garden products are creating for themselves, rather than children. Miniature gardening is now well established here, but there is still a tendency for retailers to view products as aimed at children when in fact gardeners of all ages are designing and creating miniature worlds, often from an adult perspective. This has an impact on where a retailer should display their product- place it in an area aimed at children and adults without kids will not necessarily see it. 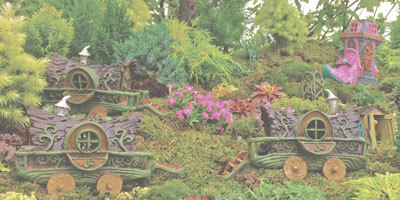 Fiddlehead have been at the forefront of miniature gardening for over 10 years in the USA and for five years in the UK. If you’re considering stocking miniature fairy garden products, we have the specialist knowledge to make miniatures a success for you. Please contact us to discuss how we can help you make the most of this exciting opportunity.